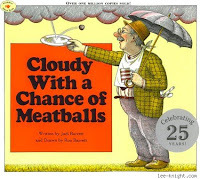 Cloudy with a Chance of Meatballs by Judi and Ron Barrett is being made into a film. It is scheduled to be released in the U.S. in September 2009 and stars a long list of current SNL members and alums. Mr. T is voicing Earl Devereaux. In a similar media-related theme, I'm home today with a sick Kiddo so we're watching lots of Disney Channel. A couple weeks ago, I blogged about Disney's Pass the Plate initiative. This morning, it was an animated cooking show called "Tasty Time with Ze Fronk". In the course of the short mini-show, Ze Fronk makes a recipe (in this case it was a tuna sandwich). The website has recipes and videos so you don't have to try and catch it on Disney Channel. I was also pleasantly surprised to find that Ethan Long is the creator - huzzah! While I certainly don't think Disney produces stuff like this out of the goodness of their hearts, I will still watch it and enjoy it. The emphasis on "deliciousness" and recipes is particularly pleasing to me.